The partial acquittal and mistrial of John Edwards was a major defeat for the Justice Department and the beleaguered Public Integrity Section — the same section involving in the Stevens trial debacle. However, as previously discussed, the case against Edwards was in my view an over-reach for the Justice Department which (again) appeared more motivated by the public outcry over Edwards’ infidelity than the actual statutory authority. The jury was correct in its ruling and showed again how average American citizens can be counted on to look beyond the sensational and disturbing conduct of a defendant to reach the right conclusion. Edwards was guilty of being a cad and a despicable person — two offenses not found in the criminal code. The Public Integrity Section team however dragged out every prejudicial element to parade his conduct before the jury — conduct immaterial to the charges. It did not work. The jury looked beyond the terrible betrayal of his wife who was dying of cancer and the salacious details of his mistress who treated Edwards aides like bell boys and maids. The acquittal on the campaign finance charge was particularly important. That was the heart of the case against Edwards and the count that many of us questioned as an over-reach of the law. The $200,000 from heiress Rachel “Bunny” Mellon was deposited after Edwards dropped out of the presidential race. The deadlock on the remaining counts shows the weakness in the government’s case. Prosecutors start such trials with a huge advantage. Despite the formal presumption of innocence, most jurors assume the defendant is there for a good reason. When you add the sensational details highlighted by the government counsel, it becomes a deadly mix for the defense. I observed during the trial that the strategy of the defense seemed to me to be a hung jury strategy. Resting the case early seemed to avoid the risk of a backlash from putting Edwards or his mistress on the stand in favor of relying on just enough doubt to divide the jury. It was a strategy based on the belief that the government would not retry the case after spending millions on a dubious case. That gamble clearly paid off. le blog est vraiment bien , merci beaucoup. Vous avez une très belle plume, bravo ! A bientôt. I thought you were Polish. Why are you speaking French? English translation: The blog is really good, thank you. You have a beautiful pen, bravo! A soon. So, mój przyjaciel, what kind of ink do you like? Talk about backfire. He should have used a condom. Now he gets to pay. Matt, that is some convoluted reasoning you have there. This was about a political “gotcha” by a Bush appointed prosecutor. It backfired. OS, The lady gets the money. She has the kid. What do you think her motivation was in the first place. Politics. Do you really think she cared about Ken Doll? She got exactly what she wanted. Matt, it was never about whether he tupped the lady, but about money and politics. Mostly politics with money as the excuse. So the Ken Doll got away with boinking his mistress. What else is new. The Justice Department has dismissed the John Edwards case. News came out just a little while ago. This closes the matter, as far as I can tell. The right decision on a case that should never have been. Distraction from the real criminals in investment banking. @skiprob: but I cannot seem to find others who get the essence of the need for justice as the cure for most of the societal ills. Oh well. People understand that justice would help, they also understand that justice requires sacrifice and effort and they would rather (seriously) pay the price of corruption if they get to watch TV four hours a night instead. Justice requires force, and force carries risk. Not just to the person’s life, although that would dissuade most people, but the risk of the winning “leadership” being just as corrupt as the last leadership. Isn’t that what happened when Russia turned to Communism? Isn’t that what happened when America turned to Democracy? Or England, or Cuba, or Iraq, or Afghanistan? Isn’t that the sequel to about 90% of revolutions, of any stripe? The reason you do not find anybody is twofold: First, that people are not stupid, they see the need for justice, they just want a solution that does not entail a lot of risk and would actually prevent the sequel. But there is a threshold of action; so the second reason is that personal pain (financial or mental agony) must be severe enough to make people willing to risk whatever is left in order to stop the pain. Until that threshold is reached, they will be stoic and suffer the losses imposed upon them, because what is left is worth having, and betting it against what might be gained is not worth the risk. You can expect change when things get worse. If it makes you feel better, I believe we will go through a repeat of the great depression in the next eight years; so that might be enough pain to make people see the need for justice. Agreed, It is kind of suprising to me though, that not even the libertarians appear to realize that we must come up with a better private sector system if we are to get the masses to come on board. I think the thought of any hierarchy scares them. http://rsjexperiment.wordpress.com I don’t know if my ideas will play out but I think they’re a decent start. I’ve put many years into their creation. Agreed on the later part as well. Very rough times ahead for the majority but I think even sooner. I think the later half of this year is going to be quite turbulent economically and may even start to spill over socially. The timer on my crystal ball has failed a time or two. “Pyrrhic victory” Doesn’t fit. 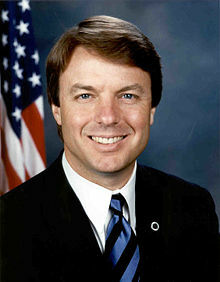 John Edwards is no Pyrrhus of Epirus. “Public Integrity Section” is an oxymoron. Everyone has “freedom” of speech, but only the uber-wealthy can cough quietly enough for our politicians to hear them. Well said Michael. We have freedom of speech so far but when the collective roar gets to loud, the oligarchs will most likely, as history has shown, start to get nervous. Freedom of speech, religion and press however or just the elemental rights. The important ones, the various property rights are for the most part gone as are the protective rights, such as redress of grievences and habeas corpus. Not much left of the American dream for the majority, hense the sad state of affairs that our country fines itself in. The answer is in my opinion, justice, but I cannot seem to find others who get the essence of the need for justice as the cure for most of the societal ills. Oh well. Thank you for that. I’ve been suspicious for awhile that many of the faux pas we see from the various government agencies that seem contradictory to Obama’s original message, were actually initiated by the large amount of holdover appointments from the Bush administration. Having worked for may years in a large bureaucracy I know for a fact that many an agency head has no idea what is happening layers below. There is much to criticize in the work of Eric Holder, but I’ve suspected that some of it came not from his doing or approval. However, that should in no way let him off of the hook, because obviously his management of Justice has been a poor one. Even if ones underlings have fiefdoms within an Agency, it is the Attorney General’s job to ensure they don’t act recklessly. This case should never have been brought in the first place, in the same sense that Martha Stewart should ever have gone to jail for insider trading. The only difference is that Stewart was an easy target for a pretense that in the world of finance justice was being served, while Edward’s reprehensible personal behavior made him seem a high profile sitting duck. I say hooray for the jury members who saw beyond the prosecutions specious case. That was quite perceptive. The fact that the Edwards message was one further to the Left than the other major candidates could well have been the motivation for destroying him. In American politics today one mustn’t have too much sympathy for the people, or the elite will get angry enough to stomp on you. That is one very interesting possibility. Now … who or what was behind the trap … doesn’t necessarily have to be someone from the other side. Maybe he’ll write a book. Yea, really interesting…..another politician bits the dust. Government is a power brokerage cartel so it is inevitable that some will get caught. They knowingly enter the snake pit. Even if he’s a pretty decent guy, he’s still complicit to the actions of government in some manner or he would not have been in the position he’s in. Interesting thought. My old poly sci professor said Washington runs on the three “B”s: booze, broads, and bribes. Maybe it stops running on them ,too.